The Durango, shown, and Charger are the most extensively reworked vehicles in Dodge's 2011 lineup. Both get new interiors and the Pentastar V-6 engine. Dodge dealers also saw revised versions of the Grand Caravan and Avenger. CEO Sergio Marchionne wowed many Chrysler dealers last week with an inspiring speech -- and tantalizing new and redesigned cars and trucks. The company showed a Jeep pickup concept, for example, and a reborn Dodge Viper due in 2012. Marchionne also told dealers gathered in Orlando that a new nine-speed automatic transmission for front-drive vehicles would be coming soon, along with an eight-speed automatic for rear-drive vehicles due in 2012. "I can assure you that there will be no other mass manufacturers in the NAFTA region other than some snotty premium manufacturer out of Europe that will be able to match the offering," Marchionne said. Here's a roundup of the automaker's product news for each brand from Chrysler releases and dealer sources. Among the biggest surprises was the 2011 Chrysler 200 sedan, which will replace the Sebring in the fourth quarter of this year. The 200 is built on the same platform as the Sebring, but Chrysler engineers upgraded virtually every system of the car to address its flaws. Those upgrades included discarding the Sebring name. The 200 gets a new interior; extensively revised suspension; improved noise, vibration and harshness; and two engines, including Chrysler's inline-four and the new Pentastar V-6 teamed with a six-speed automatic. The 200 will be pitched as an import fighter aimed at segment leaders such as the Honda Accord and Toyota Camry. But TrueCar.com analyst Jesse Toprak says the first step in that quest is to match up with its domestic mid-sized rivals, the Ford Fusion and Chevrolet Malibu. "The truth is they're most often cross-shopped with Ford and GM," he says. "If they're going to be successful, the first obstacle is to make vehicles that are better than Ford and GM." Chrysler has done extensive surgery on the Town & Country minivan, which gets the new Pentastar V-6, an upgraded interior, a new steering wheel and new interior trim. The Town & Country was re-engineered to reduce interior noise and improve ride and handling. Also, the Town & Country and 200 will be the first vehicles to get Chrysler's new winged logo. Dealers saw the re-engineered Chrysler 300 rear-drive sedan, due in the fourth quarter. It will get a new eight-speed automatic transmission in 2011. Chrysler brand CEO Olivier Francois said: "Chrysler brand and its vehicles will deliver what people deserve, not just what they expect. It will take appointments -- design, technology and engines, to name a few -- that were borne for a few and deliver them to the masses." 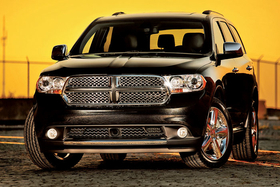 The Durango SUV and Charger will be the most extensively re-engineered and restyled vehicles in the Dodge lineup for 2011. Both will get Chrysler's new Pentastar V-6 and many interior upgrades. Extensively revised versions of the Grand Caravan minivan and Avenger mid-sized sedan were also shown. Dodge brand CEO Ralph Gilles described his brand's mission: "At Dodge, we're passionate about driving; we look forward to it. We think a car should have a personality, be powerful and fun. "We're going to put that Dodge mojo into the entire lineup." The biggest news from Dodge was the 2012 Viper. At the end of his hour-long speech on the state of Chrysler Group, Marchionne closed with a story. "There are times when you are given the opportunity to give life to something which is so beautiful and unique, so just and equitable, that you pay a lot less attention to the numbers, to the financial reality that surrounds it. They happen only rarely." As he stopped speaking, the Viper emerged from the wings. A person who was at the meeting said the car looked like a version of the Alfa Romeo 8C Competizione with a Dodge face. The Competizione was a limited-edition supercar imported from Italy in 2009 and sold at some Maserati dealerships. Jeep had a couple of surprises, too: a pickup truck concept and the next generation of the Compass crossover, due in 2012 or 2013. Dealers said it looked like a small-scale version of the 2011 Grand Cherokee. The 2011 Patriot gets a new interior and other refinements. The Wrangler will get an upgraded interior this year and the Pentastar V-6 engine next year. The pickup concept got a similarly dramatic introduction. Jeep CEO Michael Manley concluded his presentation to dealers by saying: "You never know what might show up in your showroom someday." Manley then walked off the stage, the pickup appeared, and dealers applauded. The Ram brand showed pictures of a mid-sized pickup that might replace the Dakota, which will go away after the 2011 model year.